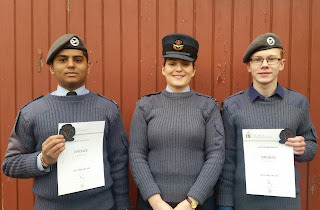 On Sunday 19th February two more cadets were presented with their Bronze Duke of Edinburgh's (DofE) Award on final parade by Officer Commanding Flight Lieutenant Rosie Robinson RAFVR(T). 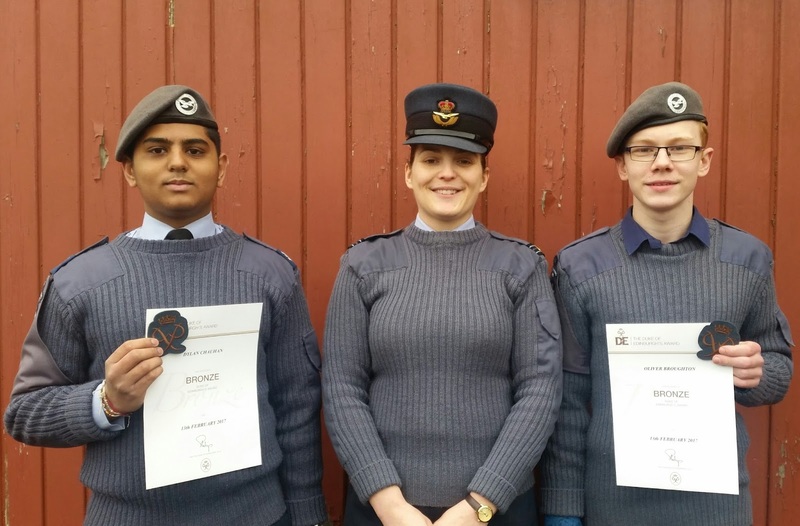 Cadet Sergeant Dylan Chauhan and Cadet Oliver Broughton have worked hard over the last year to qualify for their Bronze award which consisted of volunteering, physical, skills and expedition elements. All their work was documented on the online DofE portal and once completed they received a certificate of achievement, cloth badge for their uniform as well as a small pin badge. The two are already working towards their Silver award and planning their first walking expedition for the Easter Holidays. Congratulations to both recipients, very well deserved. A special mention also goes out to Miss Sarah Kelly who volunteers her time at 84 Squadron to skilfully run the DofE programme and encourages high numbers of cadets to pass their awards each year.